The marginated tortoise ( Scientific name: Testudo marginata) is one of three species of tortoises found in Europe. It is also the largest. They are mainly found in Greece. They are also located in lesser numbers in the Balkans and Italy. An adult can weigh up to 10 pounds and have a shell length of up to 14 inches. These tortoises have a dark carapace with yellow markings. As the tortoise matures, the shell elongates and flares out in the back, thus the name. The marginated tortoise is herbivorous and hibernates in the winter. They live more in the mountainous regions. The marginated tortoise is quite relaxed and calm, although they can be quite territorial in the wild. These tortoises can potentially live to be 100 years old. The marginated tortoise can no longer be collected and exported. Captive breeding is the only way to ensure survival of the species. A lot of thought should go into the decision to purchase a marginated tortoise as a pet.A large enclosure is necessary. Heating and lighting are a consideration, and food for these tortoises can be costly due to their voracious appetites. They also have a very long lifespan, so be sure there is a willingness to spend a lifetime taking care of them. 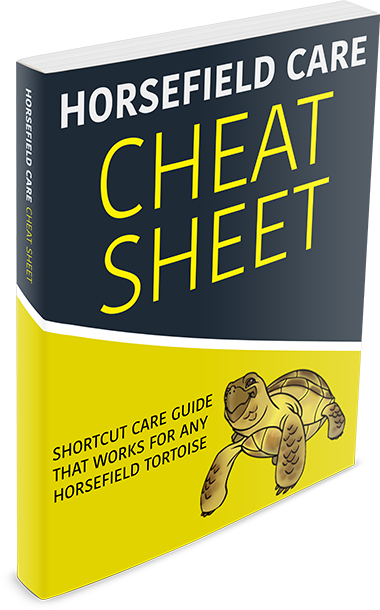 There are several online breeders and suppliers from which to buy a marginated tortoise. They are a bit pricey, so be prepared to spend quite a bit of money for one. Because of their large size and price, these tortoises are not usually found in pet stores. If they are, then more than likely they are illegally imported and may have health issues. Baby marginated tortoises can usually be purchased for around $150, juveniles are usually around $200. Adults sell for well over $300. The marginated tortoise lives exclusively off the plant life that is native to the European region it inhabits. This includes flowers, grass, weeds, and anything else it can find. Marginated tortoises are not picky eaters, so it is easy to find the right type of food for them. This should include dandelions, lettuce, clover, watercress, honeysuckle, kale, Brussels sprouts, carrots, parsnip, spinach, and peppers. Include a small amount of fruit as well, avoiding citrus fruit. Commercial pet food can be purchased but fresh, organic food is always the best way to go. Always ensure that the food was not treated with fertilizers or pesticides. This can cause severe health problems for the tortoise. 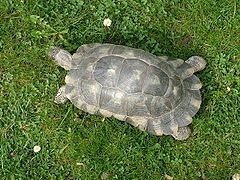 Since the marginated tortoise grows slowly, an enclosure at least 36 inches in length can be used for a small tortoise. This is equivalent in length to a 40 gallon aquarium. A vivarium setup is ideal for the tortoise. A glass enclosure will keep the humidity too high. Live plants should be used rather than plastic or silk. The tortoise will not be able to tell the difference, and eat them. That is one reason to always keep fresh vegetables on hand so that the tortoise is not tempted to eat its decor. Although tortoises are strictly land animals, a shallow bowl of clean, dechlorinated water should be kept in their enclosure. They like to dip their heads and soak. For substrate it is best to use beechwood chips or other large bark substrate. Do not use any type of sand. This can be ingested by the tortoise and cause respiratory problems.Include something for the tortoise to climb on. Ensure that it is not too steep. Housing tortoises together should be done by sexed pairs. Putting two males together will cause territorial issues. A male and female can reside together suitably. The enclosure must be large enough to house them, so the size of the habitat must reflect the size and number of the tortoises. In the Spring and Summer months, and depending on where the tortoise resides, it can be kept outside. This will give it natural sunlight exposure, which is always better than artificial light. More room to move around is also a plus. The outdoor enclosure should be protected against predators. These tortoises are quite messy, so spot cleaning must be done at least two or three times per week. A complete cleanup should be done once a month. Replacing the substrate at this time should also be a part of the cleaning process. The marginated tortoise hibernates in the winter by burrowing. Immediately after waking from hibernation, the male goes on a relentless hunt for a female. Once he has located one, he is very aggressive towards her, and will physically attack her in order to breed. Once the breeding is complete, the female will locate a nesting site to deposit her eggs. A marginated tortoise will need a large enclosure. Inside, it is recommended that a tabletop vivarium be used. Heating and lighting are also necessary to ensure the proper shell growth. UVB lighting is a must. This should be provided for at least 12 hours a day to mimic actual daylight. A basking light is also important to provide the necessary warmth. The basking light should be located at one end of the enclosure. Provide decor for climbing, hiding, and solitude. These tortoises do not like to be handled, so handling should be kept to a minimum. Provide fresh vegetables and fruit daily. Monitor the tortoise to ensure it is eating and drinking normally. Keeping the habitat clean will ensure that the risk of disease is at a minimum. Supplemental vitamins and minerals can be purchased at a pet store. Marginated tortoises can tolerate temperatures from 78F to 80F. Temperatures should not drop below 60F for a nighttime temperature. Keeping a temperature gauge in the enclosure to monitor the temperature is a good idea.